Chick-fil-A welcomes deployed sailors home with chicken sandwiches Veterans Day weekend. 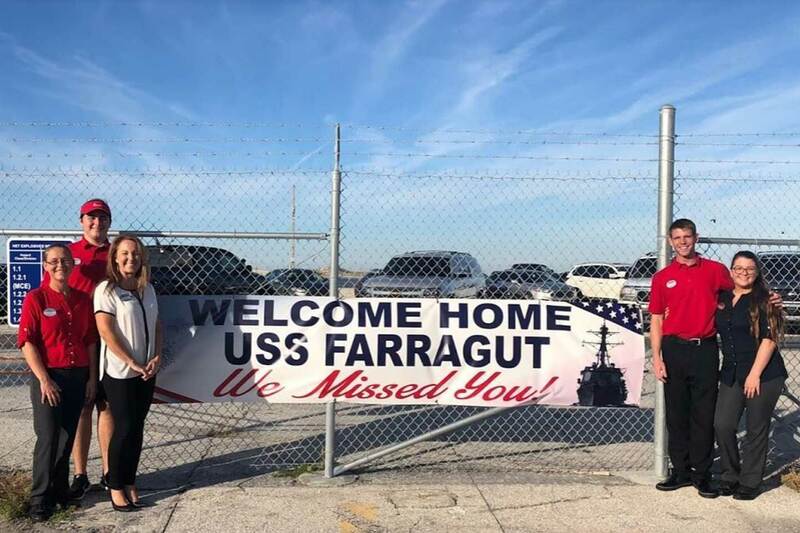 Brennan Scoggins, a 25-year-old petty officer third class boatswain’s mate for the Navy, was returning home to Jacksonville, Fla., after spending seven months deployed at sea in Scandinavia. Scoggins was close to his 321 fellow sailors and, having survived on mess deck food for so long, he wanted to give them a gift upon their arrival. He texted his twin brother, Sheldon, a business analyst for Chick-fil-A’s Atlanta headquarters. Sheldon got to work, tag-teaming with his mother to reach out to Chick-fil-A employees and Navy moms. They learned there was a true need for food; upon arrival, one-third of the sailors would be required to remain on duty, unable to leave the ship. Family members wishing to socialize with them must do it onboard. Stomachs would be growling. 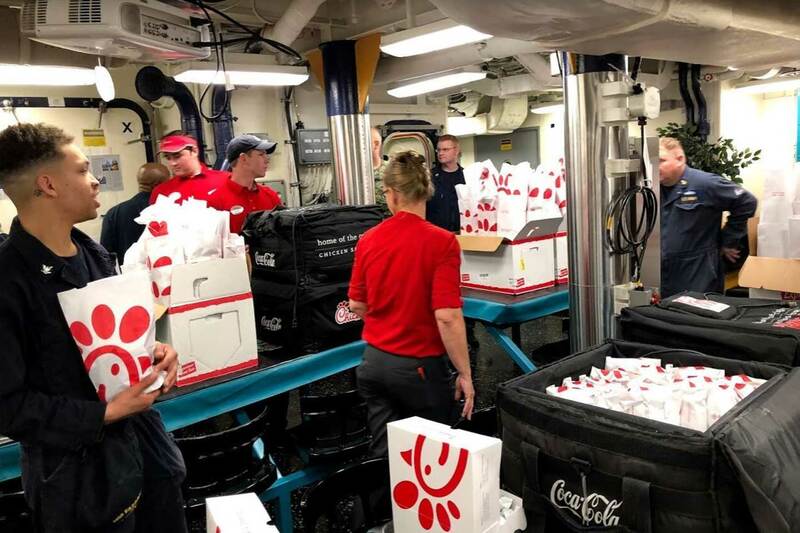 Eventually, word got out among the crew: thanks to the Scoggins family, a plan was in place to greet the sailors with a boatload—literally!—of Chick-fil-A Chicken Sandwiches. Even the executive command staff got excited. One problem, lost in translation: the happy crew thought the sandwiches were a done deal…but at this point, they were just a fantasy. Three hours later he got a response. I love the idea for this event… Please tell your brother that we appreciate his service to our country. This past Saturday, on the eve of Veterans Day, the U.S.S. Farragut sailed into Mayport Naval Station in Jacksonville. 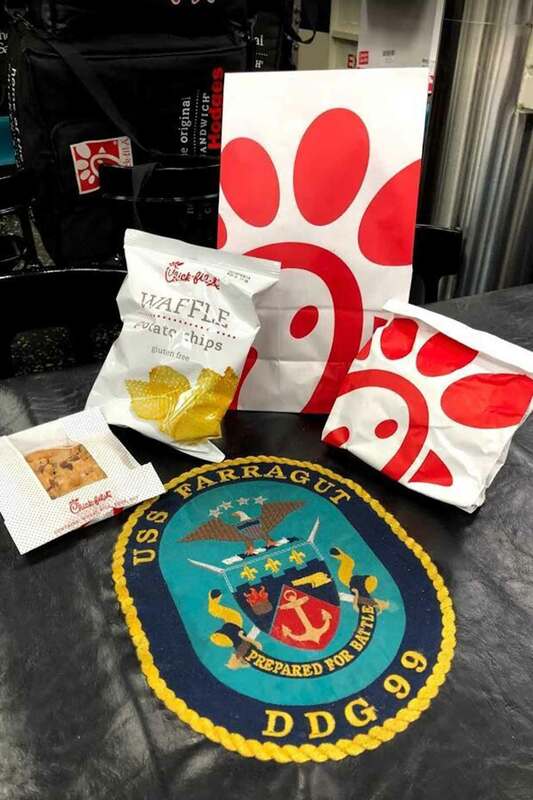 Two hours later, a special chicken-sandwich lunch delivery arrived for the on-duty sailors and their families, provided by local restaurant Operator Melinda Sowers. As fate would have it, the remaining 200-plus sailors will also partake in the experience. Each will receive a gift card for a free chicken sandwich at a Chick-fil-A near them.